Title Salamander Hox clusters contain repetitive DNA and expanded non-coding regions: a typical Hox structure for non-mammalian tetrapod vertebrates? Hox genes encode transcription factors that regulate embryonic and post-embryonic developmental processes. The expression of Hox genes is regulated in part by the tight, spatial arrangement of conserved coding and non-coding sequences. The potential for evolutionary changes in Hox cluster structure is thought to be low among vertebrates; however, recent studies of a few non-mammalian taxa suggest greater variation than originally thought. Using next generation sequencing of large genomic fragments (>100 kb) from the red spotted newt (Notophthalamus viridescens), we found that the arrangement of Hox cluster genes was conserved relative to orthologous regions from other vertebrates, but the length of introns and intergenic regions varied. In particular, the distance between hoxd13 and hoxd11 is longer in newt than orthologous regions from vertebrate species with expanded Hox clusters and is predicted to exceed the length of the entire HoxD clusters (hoxd13-hoxd4) of humans, mice, and frogs. 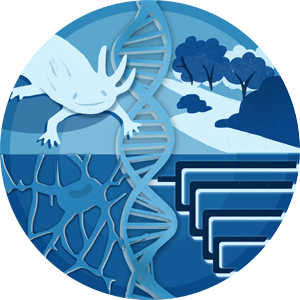 Many repetitive DNA sequences were identified for newt Hox clusters, including an enrichment of DNA transposon-like sequences relative to non-coding genomic fragments. Our results suggest that Hox cluster expansion and transposon accumulation are common features of non-mammalian tetrapod vertebrates.